A variety of mandarin orange, which includes several types, such as Minneola, Orlando, and Ugli Fruit. Tangelos are a hybrid fruit that is a cross between a grapefruit and a Dancy tangerine or a pummelo and a tangerine. 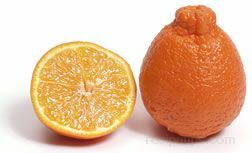 Larger in size than tangerines, a tangelo is oval in shape and generally has a bright reddish-orange outer skin and inner flesh. The shape, flavor and seed content vary with the different varieties of tangelos. The flesh is very sweet and often seedless, depending on the type. They generally have a loose skin that is easy to peel. When selecting, choose fruits that have a good colored glossy skin and feel heavy for their size, because they typically will have more juice. Fruits with damaged or broken skins should be avoided.